You can't turn a cheek in S.F. without stumbling upon a gorgeous reclaimed-wood something. From buzzy coffee shops to restaurants du jour, the handiwork of S.F. woodworkers is literally laid out right in front of you. Those benches you're perched on, the art you're admiring — okay, we get it — locals go gaga for this stuff! 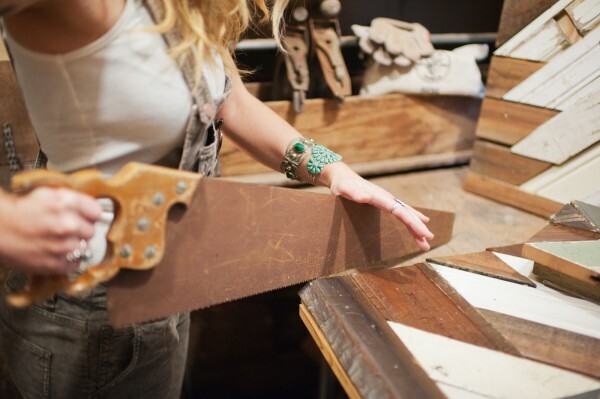 So, to get a peek at what's beyond the sawdust, we invited ourselves into the workspaces of nine S.F.-based craftsmen (and women!) to see what all the fuss is about. Lo and behold, we found that these tree-loving laborers are just as cool and stylish as the pieces they're pumping out…read on for what makes their "material" world go 'round.